It is not the owner of stage-coaches who builds railways. The term churn may bring thoughts of the process of creating butter out of milk or cream. In a modern economics or business context, churn refers to a measure of the number of individuals or firms moving into and out of a market or industry over a specific period of time. Employment churn (or attrition) refers to the number of workers moving into and out of positions. Edward Lazear, for example, recently wrote an article on U.S. unemployment, and tracked figures related to how many workers are willing to quit their jobs to seek something else as an indicator of labor market health. In a class I teach on agricultural markets, I spend one session each semester discussing entrepreneurial churn, or the number of firms entering and exiting a particular market. It is my contention, others also, that an indication of the entrepreneurial activity or energy of a particular market or industry is not only by the number of new firms created, but by the number of firms that fail. A common element of areas or regions with entrepreneurial vigor is the presence of failed firms and entrepreneurs along with the successful. While a Silicon Valley has many, many success stories, it also has many failed businesses. A failed business, however, does not have to mean a failed entrepreneur, at least not permanently. Rather, Silicon Valley and other regions like it have a culture where entrepreneurs can move past a failure to the next venture. This is at the heart of the business (or fatherly) adage, that if you aren’t making mistakes you aren’t trying enough new things. An example of a market I use in class to demonstrate entrepreneurial churn is craft beer. It’s a good example for a couple reasons. The first is that the word ‘beer’ grabs the attention of students. The second is that the industry does a great job tracking annual statistics about firm start-up and failure. In the Brewer’s Association’s latest statistics, growth of the craft brewing industry in 2010 was 11 percent by volume and 12 percent by dollars compared to growth in 2009 of 7.2 percent by volume and 10.3 percent by dollars. What does it mean when revenue is growing faster than volume, economics students? It means that the average price of craft beers is rising. This is happening in a poor economy with a premium-priced product. In addition, craft beer is growing in a market where overall sales are shrinking. Overall, U.S. beer sales were down an estimated 1.0 percent by volume in 2010. Craft brewers are selling their product against competitors with huge marketshares, (Anheuser-Busch has a market share in the United States of about 47 percent for all beers sold, Miller-Coors about 28 percent) but are still growing volume and raising prices. What about firm numbers? The number of breweries in the U.S. has increased from under 100 in the early 1990s to almost 1,800 today, a number approaching that of the U.S. in 1900. The industry has moved from a handful of mega breweries to one with many very small breweries producing a small but growing proportion of industry output. The mega breweries still produce over 90 percent of beer in the U.S., but the numbers indicate an interesting and disruptive trend. The most intriguing figures tracked by the Brewer’s Association, however, are the number of breweries opening and closing, an indication of entrepreneurial churn. 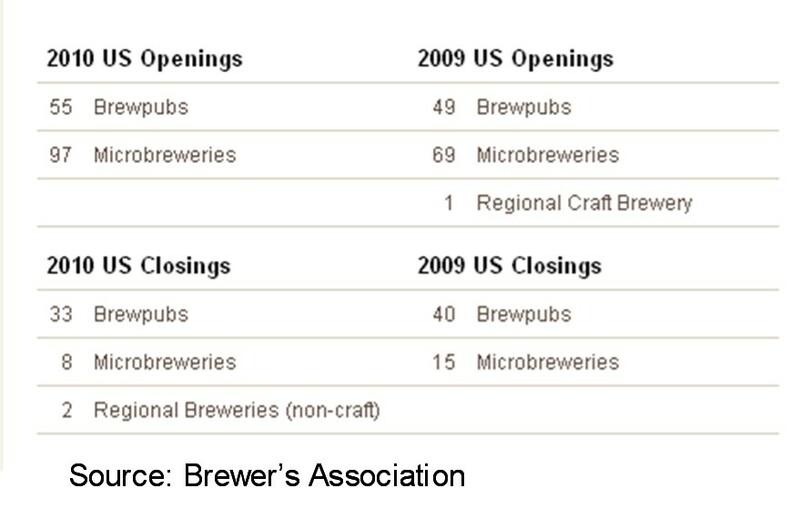 In 2009, 119 breweries opened and 55 closed. In 2010, 152 opened and 44 closed. This is a lot of business start-up and failure activity, but more starting than closing. One brewery closed for each 2.7 that opened. This churn, or opening and closing of businesses, indicates an entrepreneurial dynamic in one sector, craft brewing. Clearly the industry numbers look good, but they are driven by individual entrepreneurs who are creating new craft beer products. While market conditions (demand) must be favorable for this growth in craft beer production, the driving force is the entrepreneurs/craft beer artisans that are creating new products clearly desired by some part of the market for beer. More times than not new craft beer businesses are succeeding, at least enough to stay open for a while longer. However, not all succeed. Perhaps its an inferior product, too small a market, inadequate financing, or something else. Any number of management mistakes or unfortunate circumstances can lead to failure. It is this churn, the creation and destruction of new businesses, that is driving the beer industry in new directions. While no doubt creating many long management meetings at companies like Anheuser-Busch and Miller-Coors, it is part of the evolution of the beer industry as innovation drives it toward whatever the future holds.